When I see a locomotive I don’t remember seeing before, I can’t resist taking its picture. 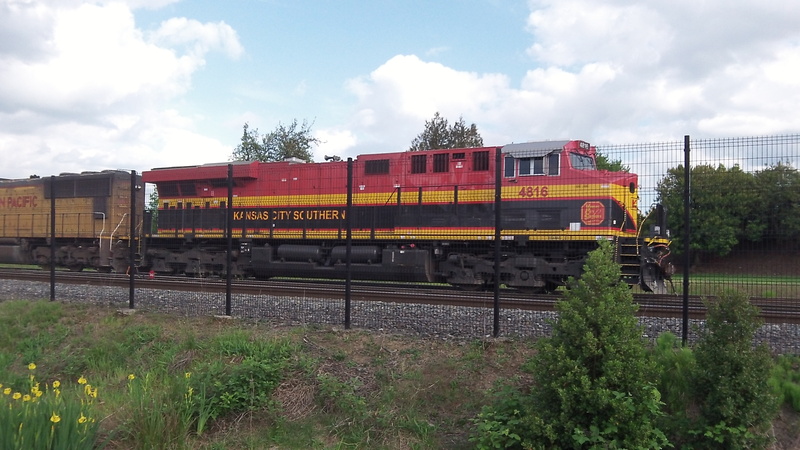 So here you are: Locomotive 4816 of the Kansas City Southern Railway Co. was parked off Seventh Avenue in Albany on Friday afternoon. What it was doing there I have no idea. Was it on loan or had it been sold to the Union Pacific? Or had it helped pull a consist — a freight train, in other words — from the Midwest or South, where the KCS operates and this engine had been photographed several times in recent months. The photos can be found online by looking for the KCS’s locomotive roster. Last December, somebody photographed 4816 in Pittsburg, Kan., where the railroad was founded. This past March it was seen passing a grade crossing in Joplin, Mo. And last month, on April 24, somebody got an image of it pulling a freight in Newton, Miss.